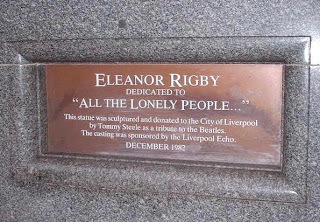 Manuscript Monday: Why all the Lonely People? I just finished a whirlwind of two weeks. It was all good stuff keeping me busy and in hindsight, I see God's grace in helping me balance all aspects of life so that family was never neglected. At one point, I had 4 speaking engagements to deliver in a matter of one week. It began last weekend with the wedding of Dominic and Jimmie Schramm. (It was beautiful wedding and a lot of fun). Then I taught at The Awakening, this past Tuesday night. The Men's ministry the very next morning was on my plate but good friend Jeff Harrison was able to teach that Wednesday morning for me so that these great men received more than my sloppy seconds. I heard he did a great job. Finally, I gave a sermon for my sermon class on Wednesday (I'm pretty sure the sloppy seconds went to my classmates, sorry guys.) Anyway, these were only my speaking engagements, not counting the other responsibilities I have in School, work and family. 1) I could hear my pastor, Gary Brandenburg's voice in my head saying , "Phil, this is ministry, You HAVE to learn how to balance it all." His "encouragement" has inspired me more on the home front than anywhere else. 2) Why do I feel more important the busier I am? This is the one that scares me. This is where balance can get off center. I confess, if I am not careful, I may just end up finding my identity in what I do - or more accurately, what I am doing. If it is in my activity that I find my identity I will never find rest. And, being that there is always more to do, I will never be able to stop for fear that who I am will be lost. This must be the life equation of the workaholic. Yet the dirty truth is that Activity is always greater than the amount of Completion. Thus for the workaholic, Identity is always in question. Ouch. Anyone else feeling this? How have you kept your balance? Over the past two Sunday's churches around the world came together organically and naturally without talking to each other and all shared the same story. What did they talk about? How did this happen? 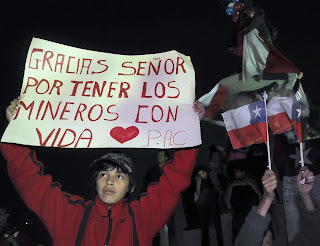 The past two Sunday's churches everywhere talked about the 33 Chilean miners stuck inside the earth for 68 days and applied it to whatever their strongest point was. For good reason too. It's a power story captivating all who hear it! It's a miraculous story of salvation portrays an amazing picture of Grace. For 68 days, the miners were unable to do anything to save themselves. As they sat in that dark pit, they were at the mercy of their friends above, without whom, it was impossible for them to survive. They provided a consistent supply of food, water, medicine, items to bolster their faith, and even entertainment. (All metaphorical of God's Common Grace to all humanity.) Ultimately, after 68 days, their lives were saved as they were pulled out of the depths of the earth to new life with a new perspective. Their entire world had changed. (Again a metaphor of God's Special Grace that brings salvation.) Both types of Grace, are undeserved favor from God to his creation. They come from the hand of God and not the will of man, or more often, in spite of the will of man. One of the miners said there was actually a 34th member on the team with them the whole time - Jesus Christ. Those miners figured something out while they were down "in the pit" and we need to realize the same thing. It is why we need to understand Grace today. We need to have an accurate understanding of Grace because When you know Grace, you will see God. When grace is at work, you know God is at work. When you are gracious it is because God has equipped you to be so. Even more, grace is abundantly seen through God's common grace to all. If someone tells me they do not see God - then they do not know grace. Manuscript Monday's are an opportunity for me to share with readers a portion of what I have prepared for Awakening on Tuesday nights at 7pm. Awakening is the young adult community of Fellowship Dallas. I do this as a sneak peak, as well as an opportunity to hear from you. Who know's your comments may end up in the manuscript! Every Monday I try and post a portion of my manuscript for Tuesday night so that you can provide feedback - maybe you can make into the manuscript! ... Let's be honest with ourselves, Christians tend to flock together in weird ways. In Fact, we've built industries on this "Christian Only" model! There's a Christian music industry that puts more assurance in the "Christian's will buy it" revenue than the actual quality of their music. Clothing lines have been developed with obnoxious says like, "Hold- Him: Jesus went 'all-in' for you!" And somehow it's even cooler when the message is somehow hidden, like in secret images or a verse secretly placed around the inside collar as if a wearer may be tricked into salvation by buying a cool looking Jesus shirt, without even knowing it. If we are not careful we can end up turning God's community into something about us, and not about Him. Something about our comforts, not about His mission to redeem the world from sin. This is the last message in a series we are doing on Community. We began by recognizing that community begins with the Image of God and because we are created in that image, we crave it. I challenged you to make it a priority to participate in the Full community that comes together on Sunday mornings. And last week I challenged you to invest into a Constant Community - those who know most about you and can be a part of the major transitions in your life. Today, I want to challenge this community of Young Adults, each one of you, to participate in the mission of God. For the brevity of this message you'll have to understand two things, First - God is on Mission. Second, that mission is to bring people into community with Himself. He is Redeeming his people. So you will hear me often refer to God's "Redemptive Mission." And guess what, God has equipped you to participate in his Redemptive Mission as well. That is what excites me! Let's pray that God would clearly show us who we are sent to, who he is sending to us, and even more, how we can participate in His redemptive mission. On Monday's I like to share a piece of my manuscript from the message I'm planning on giving At the Awakening on Tuesday nights. This gives you the opportunity to give some feedback, share your thoughts and even make it into the manuscript! Let me know what you think? Your Constant Community are those people in your life who truly know you and you know them. They are the ones who show up to the hospital, they bring you a meal when you're sick. They are the first people you call when complete a Marathon, or nail that job interview. They're the ones you call when you see Justin Bieber at the Air port - you know those real significant times in your life. The US is one of the loneliest places in the world. In 2004 a study revealed that 1 in 4 Americans had no close friend or confidant. Only 15% of Americans shared that they had a healthy circle of friends. Even though the number of people who have access to us has increased through technology, the number of people we share the intimate details of our lives with has decreased. Why do we lack Constant Community? How did we become such a lonely people? One reason is that we lie to ourselves. Maybe you think you don't need it, You are lying to yourself. Maybe you've told yourself, "I don't have enough time." Or maybe it's, "there's is no one out there I can talk to," or "They wouldn't understand, they don't know what it's like to be me." Lies!!! All Lies I tell you! When we lie to ourselves like this we are refusing to take the needed risks to develop these relationships. We are cheating ourselves and even cheating others! But there's an even deeper reason. It's because of the Fall. In Gen 3. starting in verse 7, right after Adam and Eve disobey God, a series of events happen all depicting their separation from God and each other. First in Verse 7 they experience shame because of their nakedness and they make coverings from fig leaves. (If you didn't know, a fig leaf feels like sand paper - That has to be proof of mental degradation after the fall, right?) With their genius sandpaper undies they cover the parts where they were most different from each other. Then in verse 8, their Father and creator comes to walk with them in the garden as he always has, and they hide from him! In verse ten, for the first time, God's creation was afraid of him. Then like a real man, Adam in verse 12 puts the blame on Eve! What a jerk! Today, all these separators are replayed in our lives, just as they were with Adam and Eve. Because of the Fall, and our connection to it, every day we replay these separators from God and each other. We hide in shame, we let differences build walls between us, we are afraid of sharing ourselves with the people who love us the most, and we shift the blame onto others instead of owning our sin. No wonder we have such a hard time developing and keeping our personal and intimate relationships! I can't believe this actually made it to the shelves of Target! Shannon found this lovely children beverage container complete with bendable straw. I am so tempted to take this further than I should on a public blog so I will stop writing now. Great work Disney. EPIC FAIL.